One of our newest guilty pleasures is the 1966 Elvis Presley comedy, Spinout. In Spinout, Presley plays a race-car-driving musician who is perpetually on tour thoughout the United States. But, when he and his band arrive in Santa Barbara, he discovers three women are determined to marry him and – eww! – domesticate him. Presley’s character likes women, but not enough to marry any of ’em. So the question becomes, Whom shall he marry? And, will he win the Big Car Race at the end of the film! How come Elvis’ hair never moves, even when he’s racing his convertible? How come he never carries his own luggage? What, exactly, do these movie women see in this character? Now that we’ve given you every reason to dislike this film, here are the reasons why we can’t get enough of it. There are some terrific performances in this film. Fabares, who starred with Presley in three films, is winsome as the rich girl who unapologetically uses her father’s money and influence. Betz is delightful as her powerful, boss-of-the-world father, who does whatever it takes to come out on top. However, the best performance, in our opinion, is the charming Walley, who is the heart of Spinout. There is nothing subtle about this movie, which is evident in the 3-ring-circus color scheme. No neutral shades here! The sets are delightfully and obviously fake, which is helpful in promoting the wonderfully distracting wardrobe. Even the props are amusement-park ready: Betz’s roadster, which looks like a mini Batmobile, is painted a glittery metallic gold. Take our advice: Do not watch this film if you’re hungry. Some of the characters are gourmet cooks and are forever creating fabulous dishes, such as freshly-grilled steak, tangy bearnaise sauce, cream-kissed chocolate mousse and melt-in-your-mouth cantaloupe glacé – to name just a few. These people have a way of talking about food that will cause you great dissatisfaction with regular movie snacks. Presley may not be a renowned actor, but as a singer he always puts on a good show. He sings plenty o’ catchy 1960s tunes in Spinout, and it’s easy to see why he became (and remains) a legend. Click HERE for a snappy example. 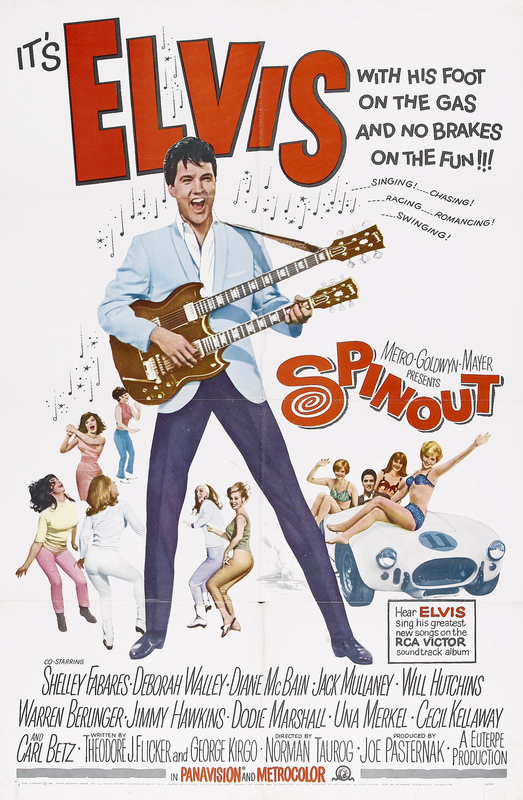 There were three Elvis movies released in 1966, including Spinout. In total, Presley made 31 (!) films, some more highly regarded than others. If you’ve never seen an Elvis Presley movie, we recommend Spinout. 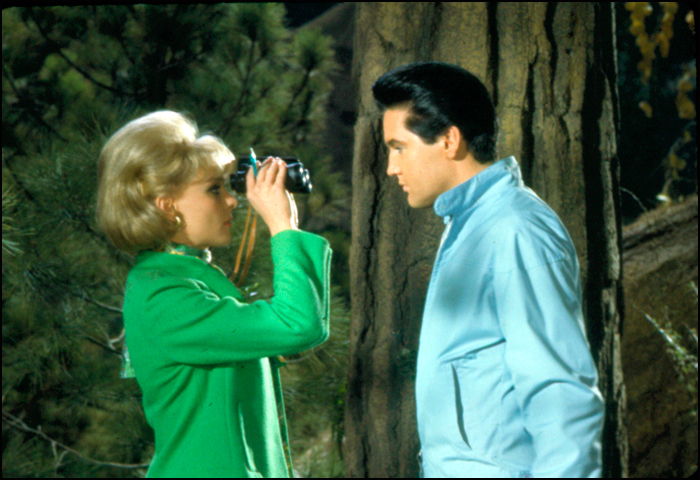 Spinout: starring Elvis Presley, Shelley Fabares, Deborah Walley. Directed by Norman Taurog. Written by Theodore J. Flicker and George Kirgo. Metro-Goldwyn-Mayer, 1966, Metrocolor, 93 mins. Previous Announcing The Great Villain Blogathon 2016! My dad loves Elvis movies and introduced this one to me. I didn’t get to see the first 15 minutes, but I enjoyed what I saw, especially the things you highlighted. (From what I can remember, the girl drummer was my favorite of the three love interests.) I’ve had this sitting in my DVR for months to re-watch it — maybe this weekend I’ll finally get to it. Yes, the girl drummer is my fave of the 3 love interests, too. She practically steals the whole film! I hope you get the chance to see it soon. I can’t help but love this movie. When it comes to rock ‘n roll, there’s no question Elvis is king. When it comes to film however, I’d be lying if I said it didn’t often slip my mind that the same Mr. Presley was a frequent silver screen star. Probably won’t check this one out, but are there any Elvis movies that are legitimately good? I’m not a good person to ask about Elvis movies. I’ve only seen a handful, all like this one. The one film (I haven’t seen) that seems to get more respect is Roustabout with Barbara Stanwyck. Sounds like rather a hoot (and I’m hungry already)! I’ve only seen one Elvis Presley film so far, though I admit I saw Roustabout mostly because Barbara Stanwyck was in it and the costumes were done by Edith Head. But it was so unpretentious, it was hard to dislike. “How come Elvis’ hair never moves, even when he’s racing his convertible?” When I watch this movie I am going to look for that and ponder on it! I would love to know what you think about this film…and Elvis’ motionless hair. Haha! You almost made me choke on my tea with your comment…! Your post is even more fun than the movie itself! I enjoyed reading this immensely! 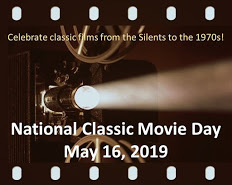 Elvis must be in the air for some reason, my latest blog post is on his last movie a couple years after Spinout–Change of Habit with Mary Tyler Moore. Yes, Elvis really was stuck in this films, which would have been frustrating. Thanks for dropping by – I’m going to check out your review of Change of Habit. I’ve never seen “Lord Love a Duck”, but I have heard of it. Yes, you should review that movie! I’ve never actually watched an entire Elvis movie, though I’ve seen a few minutes here and there, so I appreciate the recommendation. This sounds like an entertaining one, and your review is very entertaining too! This movie is pure fun. It doesn’t pretend to be anything other than it is. Hey, I’ll watch any movie with the under-appreciated Deborah Walley and Daine McBain. Both were 1960s starlets who deserved better roles in better films. I’m not a big Elvis fan, but he was OK in his pics and I’m a sucker for 1960s musicals (or films with songs…). You’re right – Deborah Walley and Diane McBain truly are under-appreciated. And who isn’t a sucker for these brightly-coloured, music-infused films! He made 31 films?! 😳 I had no idea. Sorry. They’re not going on my list. I’ve only made it through parts of a few of his films. However… Since I like you so much (and you’ve earned my trust) I will watch this one. With some cheesy popcorn. I think that’s fitting even if they try to temp me. Temp me? Is that like an extra in a movie or something? That’s awesome. Of course what I meant to say is tempt me but I kind of like the “temp” better. Yes, can you believe THIRTY-ONE FILMS?! I was stunned. There is lots to enjoy in this film as long as you don’t go in with high expectations. The cast in this film is quite talented, and I feel they make the experience worth it. Elvis was an icon… Singer, actor and such a talented, good looking Guy. I much enjoyed your review and the way you presented the different points here. An interesting look at Elvis as performer is the 1970 documentary “Elvis: That’s the Way It Is”. It gives a behind-the-scenes look at Elvis’ big show in Vegas, but more importantly, it gives you a very good sense of Elvis as a big star. I gained a whole new appreciation for him after watching it. You’re a “Spinout” girl? I’m a “Spinout” girl, too. Of course, I first saw it at the movies when I was 10. I had the album (love “Am I Ready”). Also had a crush on Will Hutchins. Probably still do. I would have had the biggest crush on Elvis Presley had I seen his movies in the theatre as a girl. I would have had all his albums, I’m sure! Now, Ruth. You know that I’ve followed wherever you’ve led — and enjoyed the ride. Elvis Presley, however, may be a bridge too far. I’ve never been a fan and I have seen plenty of him. Perhaps that’s the problem. For me, a little Elvis goes a long way and I’ve seen a whole lotta Elvis. It’s been a long time, though, and maybe time’s passing will give me a new appreciation. That’s a tall order but we’ll see.